In Part 1, Paul discussed the merits of Topps' copyright suit against Leaf. Read the article here. Part 2 continues with a discussion about the merits of the trademark portion of the case. Yesterday, I concluded that if I were offered the opportunity to represent Topps in this action (on a contingent fee basis where my firm would only get paid if Topps won the case and was awarded damages), and if this action only consisted of the copyright claims, I'd probably pass on the case. However, this case also contains trademark claims, and if those are strong, the lawsuit may still be worth taking. So, let's continue the “war game." 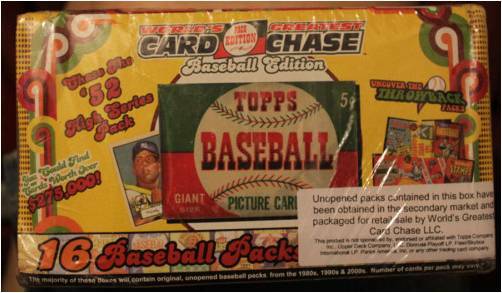 To prevail on its trademark claim, Topps will need to show that there is a “likelihood of confusion" on behalf of the consumer as to the origin of the goods/trademark at issue. Would a consumer think that the 2011 Leaf Best of Baseball product was a Topps product? Would they be confused as to whether Topps endorsed or was somehow associated with the product? Typically, a likelihood of confusion analysis requires experts and consumer surveys, both which could be very expensive. But, I think common sense shows which way the likelihood of confusion analysis will fall. Trading card purchasers know what buybacks are. They also know that Topps and Bowman products are associated with Topps, especially due to the fame of the cards in the middle of the suit. 2011 Best of Baseball also includes cards from Topps' competitors and former rivals that are now gone. That should be a clear sign that this set doesn't endorse any one company. In fact, we can take our own informal likelihood of confusion poll here by asking, “Before you read this article or knew about the Topps lawsuit, who did you think made the 2011 Leaf Best of Baseball product?" or “At any time did you think Topps somehow authorized the 2011 Leaf Best of Baseball product?" Surveys would be more complicated than that, but that's essentially what they will try to find out. And I'm quite positive any surveys would show there's no confusing. Therefore, they would be in favor of Leaf. b) Prevent Leaf “[f]rom otherwise competing unfairly with Topps in any manner." 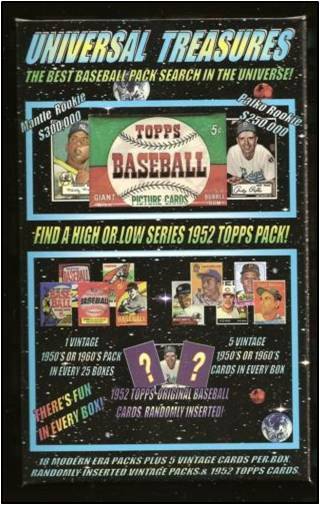 These phrases leave wiggle room that perhaps Topps will shoot for the moon and try to prevent any of the Topps' buybacks from being included in this product. Given the “exhaustion doctrine" (the defense that once you legally buy a copyrighted work, you can do whatever you want with it so long as you don't copy it), I think such a strategy would fail. So, all in all, this is not a case I would bring. What I think isn't important because, in all corporate wisdom, Topps did think they had a case that was strong enough to bring forward. The real question, then, is how strong is the case according to Topps? Topps hints in the complaint that it may seek a preliminary injunction. Whether Topps goes forward with this action would be telling. Preliminary injunctions are extreme remedies that allow the plaintiff to stop the defendant's conduct while the case is ongoing. To do that, the plaintiff, among other things, needs to show that it is 1) likely to succeed on the merits and 2) that it would be irreparably harmed (in other words, harmed in a fashion that cannot be compensated simply by money). A preliminary injunction must show a lot of evidence, so they are not often awarded. In fact, sometimes, if a plaintiff seeks a preliminary injunction in bad faith, the plaintiff can be open to sanctions. Topps did not file a motion for preliminary injunction with its complaint. This is not a requirement, but if Topps did, it would show Topps felt very strongly about its case. Topps still can file a preliminary injunction motion, but the more time ticks away, the less chance it will have of proving that it has been irreparably harmed (if it's being harmed so badly, why did it take its time in seeking relief?). I believe if Topps fails to file a motion for preliminary injunction, that is a concession that it knows its case may not be the strongest. However, even if Topps files such a motion, I suspect the court will deny it in view of Leaf's substantial defenses, or because it will be difficult to show how Topps is being irreparably harmed. Here's my prediction –this lawsuit will end with a confidential settlement and a sticker. A company called the World's Greatest Card Chase LLC sold a product called the “World's Greatest Card Chase." 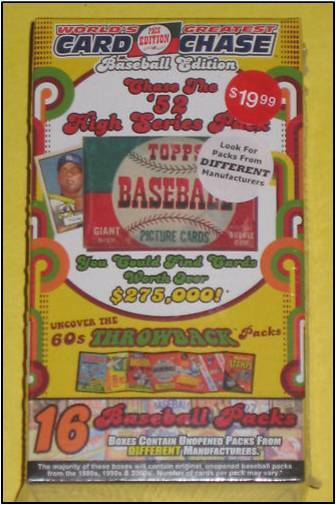 The way that product worked was that each box of the “World's Greatest Card Chase" had old buyback packs from the 1950s through to the 1990s from just about every card company out there. Included in the chase was a pack from 1952 that may have the “holy grail" Mickey Mantle card in it. As can be seen from these boxes, this card is predominantly displayed on left side of the box. Yes, that's the same card at issue in the Topps vs. Leaf suit. Now, I make my jump because I found (on eBay) one of these boxes with a sticker disclaimer that states these products are not “sponsored by, endorsed or affiliated with" Topps, Upper Deck, etc. This is total speculation, but I suspect Topps contacted the World's Greatest Card Chase after these boxes were released, and after some negotiations, decided they'd leave World's Greatest Card Chase LLC alone so long as they put these stickers on the boxes. I suspect if Leaf volunteers to stick such a warning on its products, the lawsuit may end. And it could be more than a sticker…maybe broader disclaimer or public announcement…just something to clarify (although I don't think it's necessary) that the companies that made the buyback cards inserted into Best of Baseball are not behind, and do not endorse, this product. To be fair, I am in no way insinuating that the Topps case is baseless. I think it may be difficult, but I do not give them a zero percent chance of success. This is because of what I call the Tea Party effect. Basically, if you give two speakers, debating two sides of an issue using an equal platform like TV, some viewers will believe that both speakers' positions are equally valid—no matter how weak (or strong) their arguments. Does O.J. Simpson ring a bell? Here, an attorney can still persuasively argue for Topps. Namely, Topps has been an innovator in baseball cards for more than six decades, having created the most famous and valuable cards in the world, including the “holy grail" of all cards. Without Topps' cards in Best of Baseball, the Leaf product would be worth significantly less. In fact, by putting the Topps' cards in Best of Baseball, Leaf is attempting to get a free ride on Topps' reputation to make Leaf's product worth more. If you have the facts, argue the facts. If you don't have the facts, but you have the law, argue the law. If you don't have the facts or the law, but public policy is behind you, argue public policy. And if you have nothing, just argue. The reason attorneys say this is because so long as you have an argument you're still in the game. Do you think Topps cards from the 1950’s are now in public domain?